How to find out if a PC provides particular graphics card support - PC Buyer Beware! My PC has a Gigabyte GA-H81M0-S1 motherboard. I need to know if it provides graphics card support for an Asus Nvidia GeForce GTX 750 Ti 2GB GDDR5 card, which I intend to buy if that is the case. 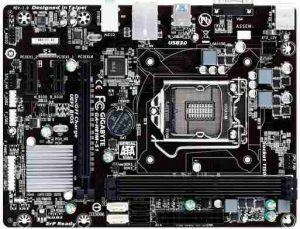 The following information can be applied to finding out what motherboard and power supply support is required to upgrade any graphics card. The Asus GeForce GTX 750 is a PCI Express graphics card that supports the PCI-E 3.0 standard. The image, below, shows the graphics output VGA and DVI-D ports on the Nvidia GeForce GTX 750 Ti graphics card that connect it to a PC monitor. The single D-sub VGA output port is blue and the two DVI-D output ports are grey. 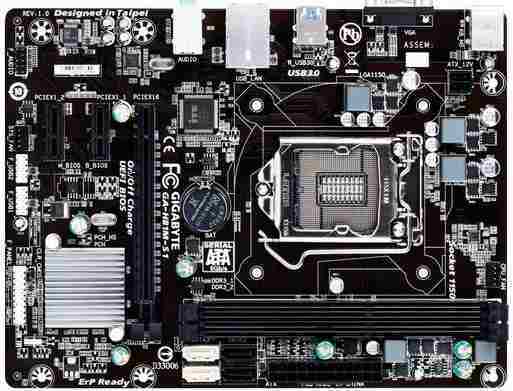 The GA-H81M-S1 motherboard, shown below, uses an onboard graphics chip and a D-sub VGA port to provide a display. It only has a single long PCI-E x16 slot for graphics card support and two short PCI-E x1 slots for other cards – the three vertical slots on the left hand side of the board. Fortunately, you can install both x8 and x16 graphics cards in a x16 slot. IGFX Sets the onboard graphics as the first display. The image below shows an AMD Radeon graphics card that requires the graphics card support of two additional 6-pin power connectors from the computer’s power supply unit (PSU). If your computer’s power supply does not provide a single 6-pin power connector, you can buy a Molex adapter cable that provides the connector. You connect the Molex end to a Molex power cable coming from the power supply and the other end plugs into the graphics card. Web-search for “molex to 6-pin pcie power adapter cable”. Your computer’s power supply unit must also be able to provide enough power for the graphics card. Use this power supply calculator to find out if your power supply provides enough power. The Asus version of this graphics card requires an additional 1x 6-pin PCI Express power cable from the power supply unit. The Zotac and Gigabyte versions of this card are powered via the PCI-E bus and so require no additional power connector(s). Note that brand-name power supplies of high quality, such as Corsair, deliver the total power that they advertise on the unit itself. Depending on which components use the power supply, it looks as if you can install that Asus graphics card on a computer with a 400W power supply if it is a quality unit. However, cheap power supplies that state that they can deliver a total of 400W usually cannot. Always buy a quality brand-name power supply. Many brand-name PCs come with a cheap power supply. Web-search the name of the power supply that came with your new PC. If it gets bad comments or reviews, replace it with a quality unit. Remember that if the power supply blows it can take the other components with it and in rare case cause a fire. Visit the Power Supply Units – PSUs section of this website for detailed information on them.